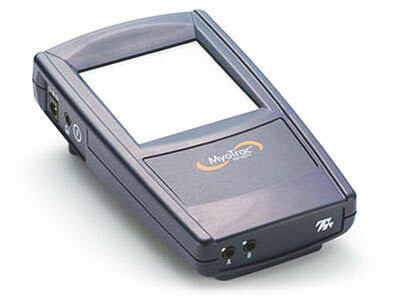 The MyoTrac Infiniti is a portable two channel SEMG device that provides high quality fast sampled (up to 2048 samples/second) SEMG in both RAW and RMS. The system can store data in its onboard memory or in Flash memory. The system can operate as a stand-alone device where results can be reviewed on the screen using a variety of functions and displays. Using the optional BioGraph software you can import the data stored on the MyoTrac's memory via flash card for analysis on your PC or display real-time results on your PC's monitor. Results can also be exported as an ASCII delimited file into your own analysis or statistical software. Graphical and touch screen display allows you to select the various functions and settings as well as see the data in full detail. You have a choice of line graph, bar graph and digital display for your results. You can also expand or contract the X or Y axis scale to view the signal as the scale that you want. Displayed statistics and results include, Max, Min, Mean, % above threshold and % versus threshold. The Infiniti software is able to record up to 2 video channels along with SEMG data. The video is usually acquired from a WebCam device connected to a USB port. The unit comes standard with 3 flying leads per EMG sensor that can be connected to the triode electrodes or single electrodes. A starter kit of these electrodes is included. Packages of 100 triodes or 300 single electrodes can be ordered. Customers can optionally attach the MyoScan EMG sensor, which includes pre-amplification and these sensors are ordered separately. There is a headphone jack for stereo sound feedback or you can use the built-in speaker. The sound feedback is associated with user-defined thresholds. Another new feature are Script sessions. Script sessions are sessions where the type, number and duration of steps within the session are pre-defined. An example would be a work/rest script. A number of pre defined SEMG scripts are also included. Batteries can be recharged by using the battery wall jack that is included. 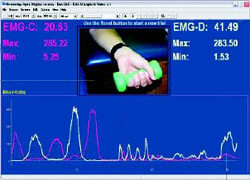 MyoTrac Infiniti is a trademark of Thought Technology Ltd.